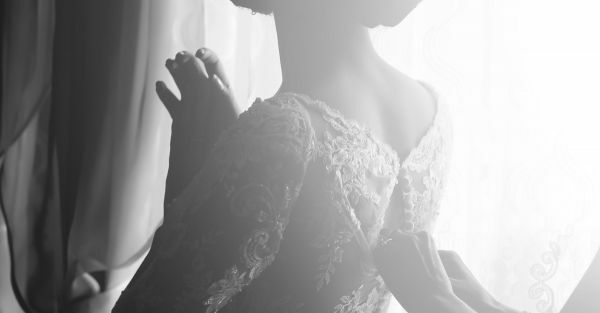 #FashionDiaries: On My Wedding Day, My Blouse Wouldn’t Fit Me!! My wedding outfit was something I had dreamt about for a long long time. I had visions of me wearing a beautiful red lehenga with a heavily embellished dupatta and walking towards the stage while Din shagna da played in the backdrop. My lehenga had to be perfect. Six months before the D-day, I started my hunt, and after visiting every possible store in Chandni Chowk, I decided to have it custom made, especially for me. My aunt suggested a trusted boutique in Shahpur Jat and after a 5 hour long discussion, the order was placed. Since mine was a chilling Delhi winter wedding, I chose to go with a blouse that had full length sleeves. A low-waist red lehenga with lotus motifs and a well-fitted short choli completed the look.The dupatta was in a contrasting burnt orange and I just couldn’t wait for the master piece to finally arrive. I was to get the outfit a month before the wedding and when I took my first trial I knew that the tailor was doing a fabulous job. The kalis and the embroidery had come out just the way I wanted and though there were some size issues, he promised to rectify it in the final fittings. Nov 1st 2015, I was called to take my final fittings and I have to admit I was awestruck. It was beautiful. The fit, the fall, the colour, the overall effect, what a beauty! I couldn’t wait for the day to arrive and get into my gorgeous bridal avatar. The designer informed me that he would be sending the outfit for dry cleaning before I could finally pick it up. The fabric tends to get a little dirty during all the trials and the fall of the lehenga is much nicer after a dry clean. A couple of days later, my mom came back home with a large velvet box that held my wedding outfit. She did a small pooja and placed it securely in the cupboard. We decided not to open the outfit since it was neatly packed and we had to carry it to the resort where the family and friends were shifting for the 3 day festivities. 26th December 2015 was my wedding date. The makeup artist arrived on time and began my transformation. Once the makeup was done, she asked me to change into my wedding blouse. You don’t want to mess up your juda while putting on your blouse later, she said. My mom and sister helped take the heavy lehenga out and all my friends and relatives in the room went all ooh and aah! Yes, this was it, my lehenga, my bridal moment, the moment I had dreamt about for the longest time… I went into the loo to change but to my shock my arm just wouldn’t get in! I pulled harder but no luck. What on earth was happening?! I was in panic. How could this be? It was my size just a month ago and I hadn’t gained weight. I rechecked, it was my blouse. My wedding blouse. I forced both my hands into it and was stuck. I called out to my sister who put in all her strength to pull it down from above my head. I had managed to get into it but I couldn’t breathe. It looked awkward, tight, ill-fitted and ugly. How had this happened? I knew I couldn’t walk out like that. Before I knew it, I was crying. Time was ticking, my makeup was messed up, my blouse didn’t fit, it was all a disaster. One big disaster. We called the designer and he confirmed that he had made no changes. By now, my sister too was losing it. She made a quick call to the dry cleaners where my lehenga was sent and that’s when we learned that the cloth had shrunk. Was it the poor quality of the cloth or an error by the dry cleaners, no one knew, but it was definitely a nightmare for me. Luckily, the designer had left enough scope inside the blouse to loosen it up if ever required. My bua came in rushing with a mini sewing kit and got down to work. I tried the lehenga, it didn’t fit on my lower waist but I could zip it up by wearing it a little higher. My makeup artist did my touch up once again and got to my hair so as not to waste any more time. By now I could hear the baraat outside the venue. My sister tried to calm me down and even called up Abhishek’s (my fiance) brother to keep the dance going for some more time! My bua, being the superstar that she is, fixed it in no time and thankfully this time the blouse fit. We used some safety pins to give it better shape and since I had to tie my lehenge a little higher, I switched my 6 inch heels with my sister’s 2 inch ones. Another half hour later, I was ready. My final look wasn’t exactly what it had looked on the day of the final fittings but it’s not like people knew! My face still looked a little stressed out from all the commotion but my super sweet besties helped me calm down and my sister sure knows how to cheer me up. When I look back at all the getting ready pictures now, I can only laugh! The pictures seem so beautiful and dreamy, but only we know what exactly went on in that room that night! * Names changed to protect privacy. Images: Shutterstock HAVE A STORY IDEA FOR POPxo? If you want to hear about it, we can write about it! Just tell us your idea here! MUST-READ: #FashionDiaries: I Wore A Stick-On Bra, But It Did NOT Stick! MUST-READ: #FashionDiaries: My Blouse Came Undone During A Sangeet Dance!